Will I be more successful in my job search if i'm certified? As a Salesforce recruiter, one of the most common questions i'm asked is ‘Will I be more successful in my job search if I’m certified’? "No evidence of a lust for learning or innovation" and "No certifications since 2013 and no other training listed". It’s not an every day occurrence, but I believe certifications AND Trailhead badges are becoming more industry recognised and valued. Whilst, in my opinion, nothing can replace commercial experience, you are doing yourself no harm through demonstrating further learning, whether that be via certifications or Trailhead. Put yourself in a client's shoes; they may have minimal internal Salesforce knowledge and two profiles appear very similar on paper in terms of hands-on experience. One has multiple Salesforce badges/certifications versus one who doesn’t. This could be a key factor in the decision making process. Also, consider that consultancies have to have a specific Partnership Value Score in ordered to be tiered at a certain level (Global Strategic, Platinum etc). Existing certifications, expanded knowledge, growth in number of certified consultants and Trailhead ranking are all worth points which contribute towards the overall Partnership Value Score. Your certifications/Trailhead badges will therefore impact your attractiveness as a hire. There's recent good news for the already Salesforce certified/Trailblazers! 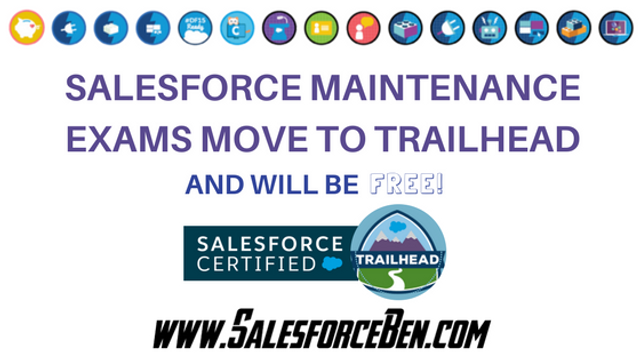 At the TrailheaDX pre-Easter conference it was announced that Salesforce certification maintenance exams would be moved to Trailhead; some immediately, with all others following by January 2019. A move further recognising the power of Trailhead, online tutorials and exams will all be housed in the same place whilst also making the certification process more cost-effective. For those already accredited, read the below for some things you need to be aware of to maintain your certifications. So it’s not only the cost-saving element this news brings but also the ability for Trailhead to walk you through the new releases and digest the content. Think about it this way, you will be able to login to one central platform, go through the module with images, videos, and examples, with a standard Trailhead quiz at the end, amazing!